Earlier this month, Tusitala was presented with a very fun, unique opportunity: to work with select students at Lakeside Primary School on creating an ebook of their own. The sessions were lively, to say the least. We always love the energy that young people bring to the table – they’re full of questions and ideas and the desire to play – all of which inspire us greatly. In teaching the children how to create an ebook, though, we also got the chance to observe user behaviour up close – giving us the rare window into how first-time users interact with new digital interfaces. We realised that for digital natives, creating digitally comes intuitively. This can be honed by encouraging them to apply that digital mindset to all their projects. Creating for digital doesn’t just involve translating a physical project onto a digital platform. Incorporating digital thinking into the ideation process is key in building the next generation transmedia stories that will take the world by storm. The brief was simple enough. The team of students and their teacher had produced a print book for an inter-school competition that they wanted to make available to the community with ease. Digital seemed to be the best way to go. 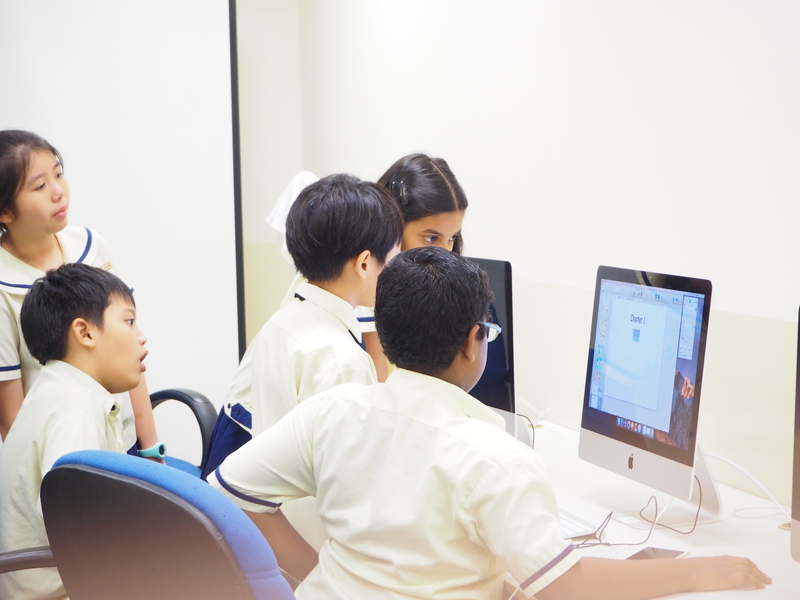 Wendy Wong, the creative director of Tusitala, led a series of sessions with the students to introduce them to iBooks Author – software that would allow them to very simply create ebooks that would be published on Apple iBooks. The software, however, was just a tool. The students’ story offered many opportunities for digital content to be incorporated beyond just narration. Upon our suggestion, the students were excited to add video content to their videos. Once they realised what could be done, they were eager to explore. Eventually, they added video interviews to their story to add depth and intrigue. Learning that the digital version of their book didn’t have to be confined to its print counterpart helped the students incorporate the digital mindset to content creation. We were so happy to be a part of their moments of discovery and delight as they navigated through the process. It is our hope that more authors engage with digital in this way – being open to trying something new and being curious as to how it can work for your story. In addition to this, the sessions invariably taught the students basic UX principles. How to choose layouts that would guide the reader towards content in a particular way, for example, and how to maintain visual consistency through font and colour choices. While making UX decisions is an important part of digital education, we must say some of the students looked more than a little disheartened when they realised their favourite fonts and flourishes may not be incorporated into the final product. Another issue we touched upon briefly but merits further inquiry is the murky water of copyright. With digital, procuring content is quick and easy. Copyright laws for digital content aren’t as clearly defined. As more classrooms go digital, teachers and educators need to be made aware of copyright laws to ensure that students use digital resources responsibly without exploiting content creators.